Sean McDermott drives to the basket. McDermott scored 14 points in the loss. Jimmy Lafakis/Collegian file photo. The Butler men’s basketball team’s season came to an end with a 80-76 loss at Nebraska in the first round of the NIT on March 20. Butler finishes the year with a 16-17 record and a 2-10 mark in true road games. Sean McDermott led the Bulldogs with 14 points and also contributed seven rebounds while Paul Jorgensen added 12 points. 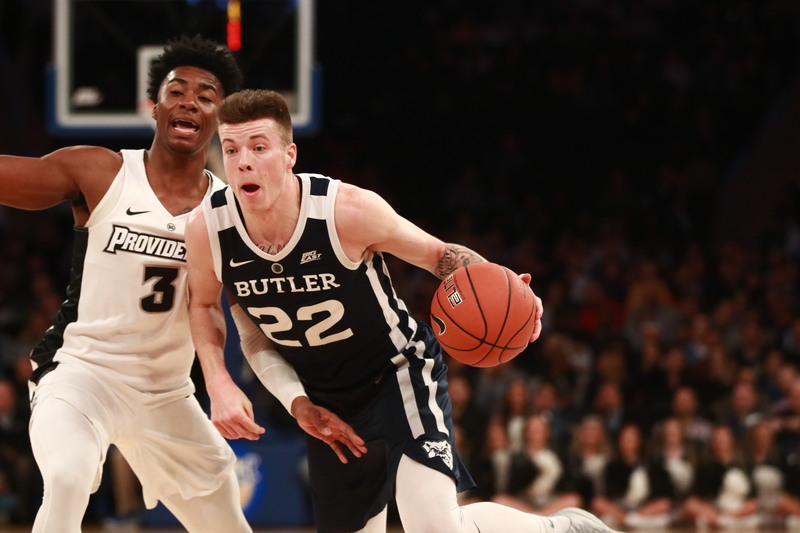 Six different Butler players ended with at least nine points and Aaron Thompson finished with a career-high 12 assists. Meanwhile, 85 percent of Nebraska’s points came from three players: Isaiah Roby, James Palmer Jr. and Glynn Watson Jr. The Bulldogs shot 46 percent from the field compared to 50 percent for Nebraska. Butler scored 14 of the game’s first 16 points and held the Cornhuskers to five points in the game’s opening 7:51. Nebraska answered with a 17-8 run to tie the game at 22 with 5:49 left in the first half. The teams traded buckets until halftime and the Cornhuskers held a 31-30 advantage at the break. Roby, Palmer Jr. and Watson Jr. accounted for all 31 of Nebraska’s points. Sixteen of the Bulldogs’ 25 field goal attempts in the opening 20 minutes came from beyond the arc. They connected on eight of them and shot 44 percent from the field. Nebraska was just 3-of-12 from three and 11-of-29 from the floor but got 17 points from Roby. Butler took a 40-38 lead early in the second half before the Cornhuskers went on a 10-2 spurt. The Bulldogs scored the next seven points, capped off by a Jorgensen three. After a pair of Joey Brunk free throws put the Bulldogs up 51-50, Nebraska used four layups and six free throws in a 14-2 run to surge ahead, 64-53, with 6:32 remaining. Back-to-back threes from McDermott cut Butler’s deficit to six. With the Bulldogs down 71-67, Jordan Tucker converted a three-point play to bring Butler within one. After a Nebraska free throw, the teams traded baskets to make it 74-72 with 52 seconds left. Nebraska scored six of the final 10 points to secure the victory. Butler’s 16 wins are the fewest since 2013-14. It is just the second time in the last 14 seasons the Bulldogs failed to reach the 20-win mark.